The C’tan (Eldar Yngir) are said to be the oldest beings in existence. 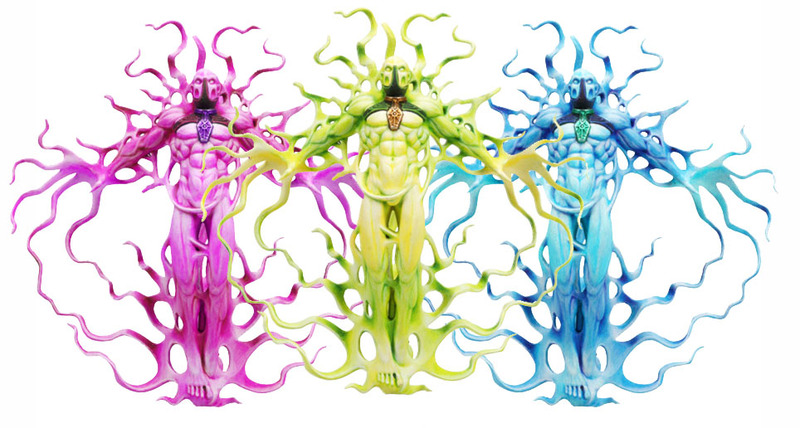 Once beings of God-like power they were overthrown by their followers, the Necrons, and most exist now only in the form of the C’tan Shards. It is said that the C’tan were created at the very beginning of the universe, spawned from swirling gases and enormous amounts of energy, and as such are etheric creatures by nature. In their natural form they are vast beings and spread themselves over the surface of a star, sucking at its energy to feed themselves. After a time, they learned to use diaphanous wings to travel to other stars to continue their consumption. The matter around them was so insignificant that it didn’t even register to their voracious appetites. After several million years, the race known as the Necrontyr discovered a being feeding from their very sun. The Necrontyr, under the leadership of Szarekh, “the Silent King,” managed to communicate with this being, naming its species the C’tan; which in native Necrontyr means “star gods,” or “star vampires”. Eventually the Necrontyr built physical bodies for the C’tan made from Necrodermis or living metal. The C’tan were then transferred, supposedly across an “incorporeal starlight bridge,” into their new bodies – thousands of miles of energy creature compressed into comparatively tiny bodies. 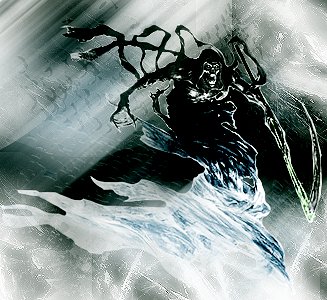 The C’tan made use of the Necrontyr’s hatred of the Old Ones to wage war and collect bodies to consume, which they enjoyed far more than their old diet of star energy. They also found a love of worship, or more accurately, of others worshipping them. They were revered by the Necrontyr as gods and forced them into complete slavery. The C’tan eventually tricked or convinced the Necrontyr into leaving their bodies and entering shells of living metal, becoming the Necrons. In the war between the C’tan and their slaves the Necrons, against the Old Ones and the younger races, their red harvests slaughtered millions upon millions. Not long after that a plague of Enslavers emerged, which apart from finally destroying the Old Ones, also depleted the red harvests further. It was then that Szarekh, realizing the error he had made by dealing with the C’tan, led a Necron revolt against their masters. In their arrogance, the C’tan did not realize their danger until it was too late and the Necrons shattered the C’tan with weapons that focused the unimaginable energies of the living universe. Since then, the C’tan have been shattered into shards, utilized by the Necrons in battle. Transcendent C’tan’s are C’tan’s bursting with pure elemental energy. Each Transcendent C’tan is a collection of anywhere between a dozen and a hundred lesser shards, and its power far surpasses the sum of its parts. Shards of these mighty creatures are used by the Necrons as weapons by entombing them in Tesseract Vaults and controlling them with a Canoptek Sentinel and energy shackles designed by Svarokh.Should the situation become dangerous enough, the Necrons may release the Transcendent C’tan from its prison to rampage across the battlefield. This however is often as dangerous to the Necrons as is it to their foes. Antimatter Meteor – The C’tan Shard gathers an orb of roiling antimatter, before hurling the crackling projectile into the midst of the foe. Cosmic Fire – At the C’tan Shard’s gestured command, a pillar of black fire streaks down from the heavens. Seismic Assault – Stone fractures and ores flash burn into silvered steam as the C’tan Shard drags up tides of magma from deep below. Sky of Falling Stars – Savagely beautiful orbs of coruscating light plummet from the cold depths of space, growing to roaring bale-stars as they approach. Time’s Arrow – Mutating the flow of causality and remoulding the temporal stream, the C’tan erases its foe’s very existence from space and time. Transdimensional Thunderbolt – The C’tan Shard projects a crackling bolt of energy from its outstretched palm, blasting its foe into oblivion. The major weakness of the C’tan is their inability to comprehend the warp. It is speculated that they find it impossible to survive in it and are particularly susceptible to warp-spawned magicks and psykers. They had a plan to block off the warp forever in an attempt to remove their single greatest threat. It is also speculated that they have set up a series of pylons on Cadia, possibly for this purpose. Whether these pylons have anything to do with the Eye of Terror is unknown, but it is unlikely, as the Eye was not opened until after the C’tan were in their stasis tombs. There is also a Necron object on Armageddon in the central region of the planet. During the Great Crusade, it is known that the Imperium encountered a suspected C’tan device known as the Vortex field generator which would later be relocated to Jericho fort and making that site invulnerable to orbital bomardment. The armies of the Imperium are known to guard the Gates of Varl from the quiescent perils of the Ctan. Members of the Imperial Assassin Callidus Temple use a weapon called the C’tan Phase Sword. It is unknown what specific relation the weapon has with the C’tan themselves, but when it comes into contact with a C’tan’s body it is absorbed as if it is a piece of its body returning home. The fate of the C’tan differed from current lore in previous editions. 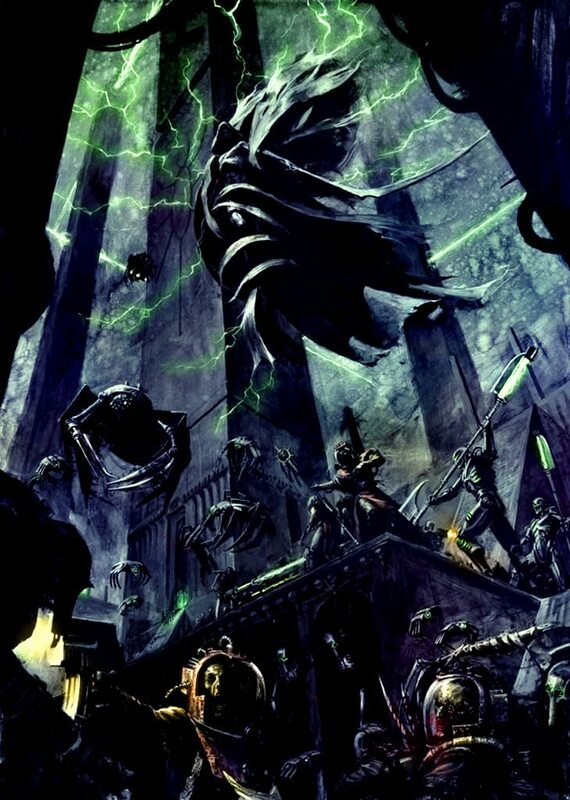 Prior to the publication of Codex: Necrons (5th Edition), the C’tan were described as having been in an aeons-long slumber from which they are only now awakening, rather than having been shattered into the C’tan Shards. How many C’tan Can You Name?